Farmgirl Fare: 5/17/11: The Daily Donkey 100! I'm so sorry, but other than being a "kick-in-the- pants" what is the purpose of donkeys on your farm??????? Don't get me wrong, I love them to death. 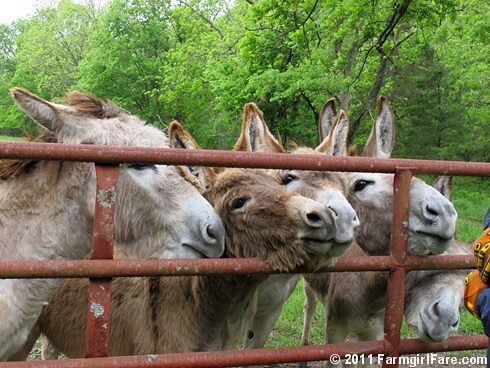 Ahahahaaha - donkeys bring the joy of the circus and earloads of humor to Farmgirl's Farm and by extension to all of us. They are the Crazy Wisdom sages that lighten our load just by being so fabulous. Ha - everything Tobey said. I usually simply refer to it as priceless entertainment value, but her explanation is so much better! Plus the donkeys do a minimal amount of guarding against predators and keep down brush and weeds that nobody else will eat.